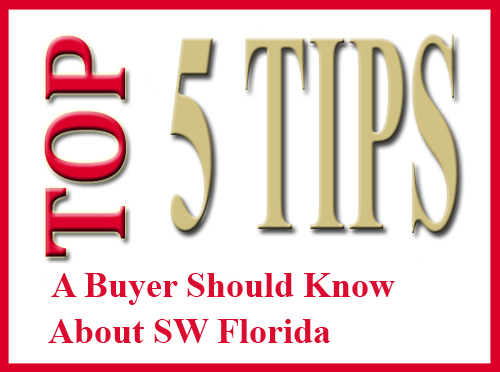 A few weeks ago we wrote about 5 things a buyer should know about Lee County Real Estate, so we thought we’d follow-up with a version strictly for sellers. 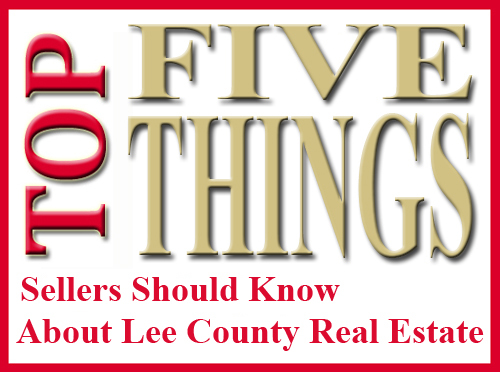 5 Things a Seller Should Know About Lee County Real Estate. Prices are Falling. Don’t get too alarmed here as it’s not unusual for prices to fall this time of year. It’s more of a statistical anomaly. Prices are still up over last year’s numbers, but they are falling monthly. Next season will be the barometer. Some sellers mistakenly believe they can ask anything for their property and it will sell. This is not true. Its funny how the seller believes their property is worth so much more than everybody else’s property, but when they are the buyer they look at things differently. We Must Sell Your Property 3 Times. First, we must sell it to other agents. If they believe the property is over-priced they won’t show it. Next, we must sell it to the buyer. The buyer is the one out looking at all available like kind properties. If they feel it’s over-priced relative to other similar listings, they’ll make an offer on something else. Lastly, we must sell it to the buyer’s bank. The bank orders an appraisal not for the buyer’s benefit but for their own. If the appraiser says we sold it for too much we’ve got a problem. If we fail at any of these 3 sales, we don’t have a sale. Interest Rates are Rising. This takes purchasing power away from the buyer. Every 1% rise in rates eats away 9% purchasing power from the buyer. If there are a limited number of buyers for your home today, rising rates will chip away and steal some of those buyers from you. Flood Insurance Rates are Going Up. Some say rates could double or triple on certain properties. If you don’t sell, this could affect your bottom line. If you do sell, it could affect the buyer’s bottom line, which could influence their offer. Your home doesn’t have to be waterfront to be affected. Rising Values Brings More Competition to the Table. Yes, inventory is limited today, and it has helped propel home values. As values rise, expect more competition from other sellers whose value rose above water on their current mortgage and can now afford to sell, or from sellers who are just ready now and have waited for values to climb to a certain point. Builders are now entering the fray because home values have risen enough for them to be able to compete again. This is actually a good time to sell right now. The odds of selling right now are as high as they’ve ever been, if your home is marketed and priced properly. We saw over-priced homes in the height of the Boom fail to sell, and we’re seeing it today. We are saying we have a good market. We’re also saying don’t get too greedy or you could be one of those sellers saying I wished I hadn’t over-priced my home back when the market was good. Real estate works in cycles, and we’ve heard this repeated too often. Feel free to search the MLS at TopAgent.com. Good luck and Happy House Hunting!!! Yes, we said it, and don’t be alarmed as we’ve said for months we wouldn’t be surprised to see prices pull back a bit due to seasonality. 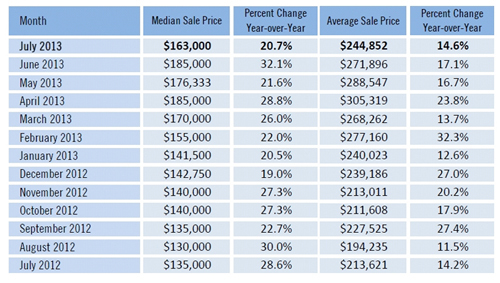 Median sale prices are still up 20.7% over last year. As you can see from the single family homes median price chart, most of our gains occur in season January through April. That’s because more of the expensive homes sell that time of year pulling the median price up. SW Florida Sale Prices Retreat. We’re still receiving multiple offers on many properties and inventory is as low as ever. Last year there were 5,668 active homes on the market and this year there is only 4,924. Closed sales are up 6.8% over last year and they’d be much higher if we had more inventory to sell. Cash sales accounted for 51.7% of all single family home MLS sales which is really helping with appraisals. In a rising market it’s sometimes difficult on appraisers because they’re using comparable sales from the past even though the market is rising now. Cash sales typically aren’t subject to appraisal, so as they close they provide fresh new sales data that is sometimes more indicative of the market. In July 1,466 new listings came on the market. Some of these aren’t actually new listings as they could have been withdrawn or expired and re-listed. July also saw 1,149 listings go pending, so approximately 78.4% of the new listings went pending. In reality it wasn’t because some of the pendings would have been on properties listed before July, but it does show that the market is turning over at a high rate. Average days on market are falling to 49 days now, down from 57 in June and 60 in May. This is a result of buyers having fewer choices when searching for homes. Buyers are really surprised when they find out there are only a few homes on the market that match their criteria. If you’re considering selling now may be a good time to research your options. Inventory is critically low and we’ve been selling our listing inventory to the point we have few listings left. We’re selling them as fast as or faster than we can list them. Just because it’s a seller’s market it isn’t a license to get crazy on pricing. Prices are going up however we don’t have runaway prices as the overall economy still limits how fast and how far prices will rise. If we had a great economy prices could be much higher, although we would see more sellers entering the market which would add supply. Builders are building again which is helping pick up the slack as today’s market just can’t fill the demand. Buyers are often left scratching their heads wondering how they’re losing homes to other buyers. If you’re a buyer and you want the house, don’t leave the door open for the seller to entertain other offers. If you’re offering below asking price and the home is priced fairly, expect that someone else will offer full price or more. More buyers are losing their first or second choice by leaving the door open. Price isn’t the only way to make your offer look good to the seller. Offer friendly terms, larger escrow deposit, and position yourself from strength. Sellers not only look at price but how likely the buyer is to actually being able to perform. If your offer is light on down payment, has contingencies, or other outs the seller may question your ability compared to other buyers. The past several months we’ve been reporting rising home prices in SW Florida. Everyone seems to agree the Southwest Florida housing market is in recovery. For awhile we’ve had tight inventory with escalating prices. Periodically we like to go inside the numbers and breakdown various facets of the market. 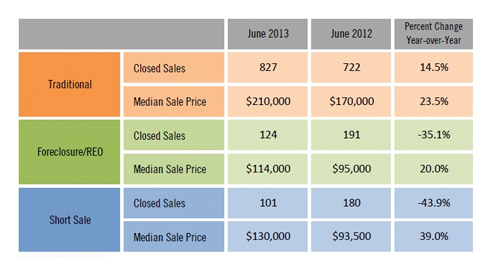 June 2013 SW Florida Real Estate Numbers. Today we’re looking at traditional sales versus distressed sales. As you can see from the attached chart foreclosure sales are down 35.1% from last year and short sales are down 43.9%. Traditional sales are helping to pick up the slack but the limited inventory is holding sales down. In other words, if we had more inventory to sell we’d surely sell it. 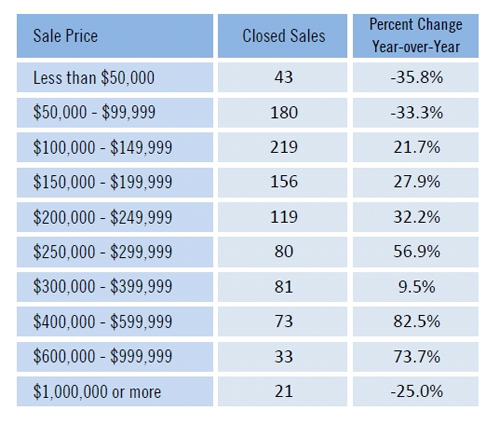 Traditional median sales price increases to $210,000 which is allowing many more sellers who were previously underwater the ability to sell their home without being a short sale. However, there are still plenty of underwater homeowners who’d like to sell but are trapped. They’ve held out this long and don’t want to jeopardize their credit by selling short, so they wait. People talk about shadow inventory from the banks as if they’re holding back inventory waiting for prices to rise. We don’t believe banks are holding back. We don’t believe there is a glut coming to the market. There will still be more foreclosures in the future as economic growth is anemic and underwater owners are still susceptible to changes in their personal employment situations, however we believe it will be a manageable number. The real shadow inventory is the trapped homeowners waiting for the market to come back to a point where they can afford to sell. In a normal market sellers buy and sell locally as their wants and housing needs change. This hasn’t been happening here locally until recently. In the past few months we’ve had several sellers placing their home on the market only to buy a different home that better serves their needs locally. This trend will continue as prices rise, and especially in light of the fact interest rates are still relatively low, currently in the mid 4% range. 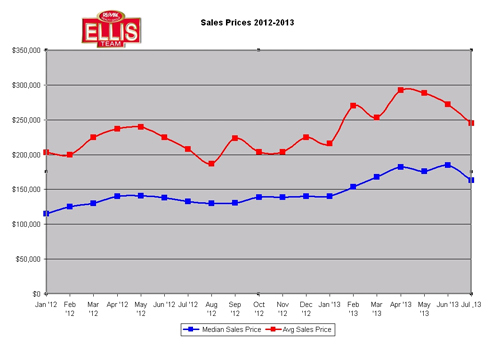 As prices rise we could see a little more inventory which will increase sales volume. Builders are building again which is helping to pickup the slack due to the shortage in inventory. We are seeing more homes come on the market in the $200,000-$300,000 range which should boost home sales in that range on inventory levels alone. We’ll begin to see move-up buyers, lateral buyers, and transitional buyers who may not want as much yard or as much home due to their age. One thing is constant is that the market is always changing, and we’re witnessing some pretty phenomenal positive changes in our market right now. Because our market was healing for so long some started to believe we’d never see this day. It’s easy to get bogged down on what has been and lose focus on where the market is today and where it’s going. Real estate is a lot like a sports team. “What have you done for me lately?” The glory years of yesteryear don’t matter. What your home used to be worth on paper is in the past. The only thing that matters is today, the here and now. A property’s value is not what someone paid for it a long time ago but rather what it’s actually worth today independent of its former value or cost. Cost does not always equal value.